Understand these emerging requirements and how to adhere to them. 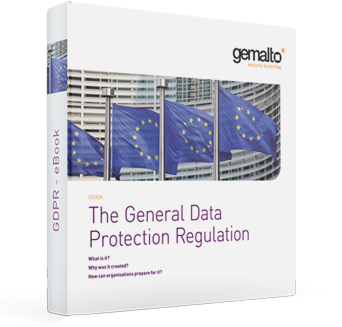 Many organisations now need to start adapting their business approaches, operations, and security practices to manage GDPR compliance. 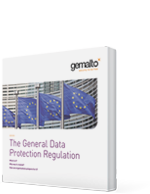 Download Gemalto's GDPR eBook to see how Gemalto can help you identify the key aspects of GDPR and what steps to take to address its requirements. 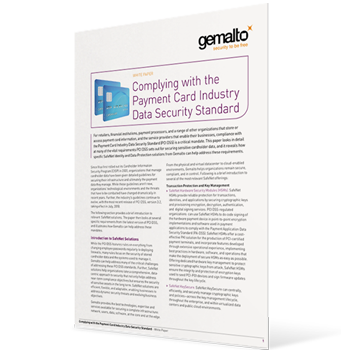 Complying with the PCI Data Security Standard. Learn how electronic signatures can help create a trusted digital market. Meeting the new regulations for eCommerce in Europe. Learn more about the Solutions for NYDFS Compliance. 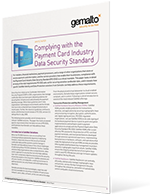 PCI guidelines continue to evolve with the most recent release of PCI DSS, version 3.2, taking effect in July 2018. PCI DSS 3.2 adds multi-factor authentication as a requirement for any personnel with non-console administrative access to the systems handling card data. 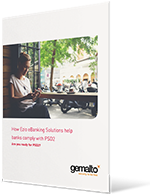 Download Gemalto's PCI Whitepaper to learn more about the vital requirements PCI DSS sets out for securing sensitive cardholder data. NESA's Mandatory Cryptography and Authentication Security Controls for the UAE. 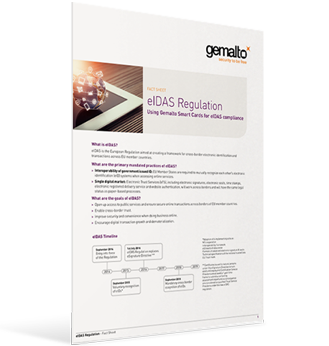 One goal of the new European regulation (eIDAS) is to create a single digital market. This means Electronic Trust Services (eTS), such as electronic signatures, will work across borders and will have the same legal status as paper-based processes. 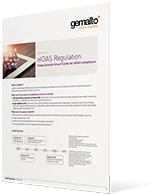 Download Gemalto's eIDAS Quick Facts Guide to understand and help navigate eIDAS goals and the benefits for your business. Understanding and meeting the new regulations for eCommerce in Europe. Banks and financial institutions have until January 2018 to comply with the European Union's revised Payment Service Directive (PSD2) which was introduced last year. 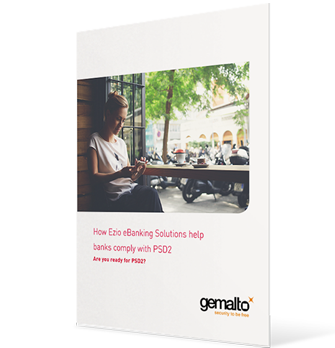 Download Gemalto's PSD2 white paper to see how Gemalto can help banks and financial organizations to meet the technical requirements of PSD2 for secure online and mobile payments. Learn more about NESA's Mandatory Cryptography and Authentication Security Controls for the UAE. 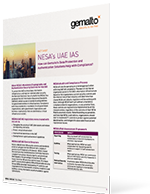 Compliance with NESA's UAE IAS standards is mandatory for all government organizations, semi-government organizations and business organizations that are identified as critical infrastructure to the UAE. Download Gemalto's UAE IAS Quick Fact Guide to learn more about the security controls and standards set out by NESA, and which sections of the guideline Gemalto's Data Protection and Authentication Solutions can help your organization prepare for. 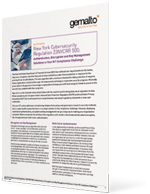 Learn more about the Authentication, Encryption and Key Management Solutions for NYDFS Compliance.